When going to study abroad, Indian students or their parents would have to transfer money abroad to pay university tuition fee and maintenance expenses abroad. In such a scenario, it’s natural to have doubts regarding what are the RBI rules for money transfer abroad in India. This post tells about the relevant RBI rules and also how to save money on outward remittance from India. Outward Remittance falls under the Liberalized Remittance Scheme (LRS) of the Reserve Bank of India. LRS specifies the rules and limits regarding remittance of money outside India for the purpose of education. As per the Liberalised Remittance Scheme, Authorized Dealers can allow money transfer abroad up to US$ 2,50,000, by resident individuals per financial year for permitted current account/capital account transactions or both. The LRS scheme is not applicable for corporates, partnerships, firms, trusts, HUF etc. The limit of US$ 2,50,000 can be used in a single forex transaction or multiple forex transactions combined in a financial year. Note : In the case of the remitter being a minor, their natural guardian must sign the LRS declaration form (A2 Form). A host of activities are explicitly prohibited under FEMA & LRS. These include remittance for purchase of lottery tickets, trading in foreign exchange abroad, lottery winnings, remittance of income through racing/riding or other hobbies, outlawed / illegal magazines, and sweepstakes, etc. You can draw more foreign exchange than the LRS limit of USD 2,50,000 under special circumstances. For amount exceeding the LRS limit, Authorised Dealers may release foreign exchange under general permission based on the estimate from the doctor in India or hospital/ doctor abroad. AD Category I bank and AD Category II may allow remittances (without seeking prior approval of the Reserve Bank of India) exceeding USD 2,50,000 based on the estimate received from the university/institution abroad. For expenses abroad which are related to studies and medical treatment, and exceeding the LRS limit, an individual may be permitted to avail more foreign exchange than their limit of USD 2,50,000, provided they produce the required document proof. Medical expenses abroad – Estimate from the doctor in India or hospital/doctor abroad. Study abroad – Estimate from university/institution for tuition fee (and or maintenance expense). Resident Indians going abroad from India are allowed to purchase foreign currency notes / coins only up to USD 3000 per visit. Balance amount can be carried in the form of stored value cards, traveller’s cheque or banker’s draft. An Indian student going to study abroad would be allowed to carry foreign money in the form of cash only up to USD 3,000 (or its equivalent in other currencies). By cash, it means carrying money as currency notes / coins. Going by today’s US dollar exchange rate in India, USD 3000 comes up to more than Rs 2,20,000. This is enough money to take care of the immediate expenditures of a student when moving abroad. The balance forex limit of the student (USD 2,50,000 – USD 3,000 = USD 2,47,000) may be carried in forex card, traveller’s cheque or demand draft. 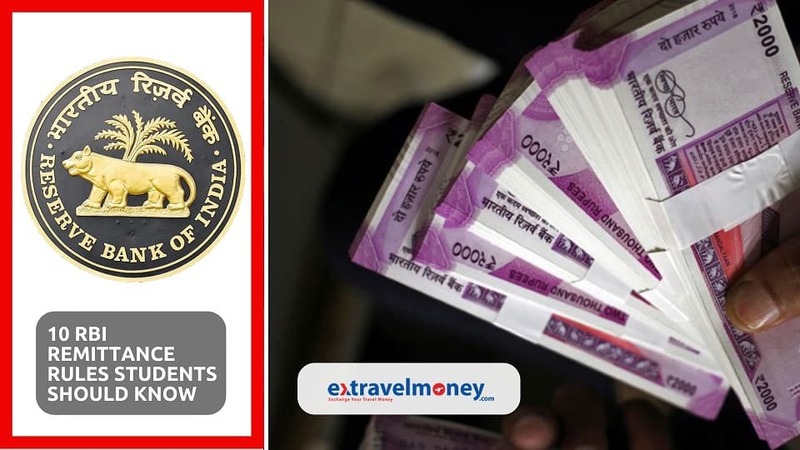 Foreign exchange for travel abroad can be purchased from an authorized person against rupee payment in cash for transactions below Rs.50,000. However, if the sale of foreign exchange is for the amount equivalent to Rs 50,000 or more, the entire payment should be made by way of NEFT/RTGS or debit/credit card. For Outward Remittance, only NEFT/RTGS options are the only payment modes available. When Indian students are going to study abroad, they’d need foreign currency to take care of their initial expenses abroad. This foreign currency can be bought in India as either cash or in forex card. If the total value of such a transaction is below Rs 50,000, then one can pay for the forex transaction through cash payment in Indian rupees. However, if the total forex transaction value is above Rs 50,000 then the only payment mode available is NEFT/RTGS (online banking) or debit/credit card (Payment Gateway available through ExTravelMoney). Usually, money changers don’t have swiping facility (PoS Counters) for debit/credit card transactions. As per AP (DIR) Series Circular No. 32 dated June 19, 2018, it is mandatory for the resident individual to provide his/her Permanent Account Number (PAN) to make outward remittances under the LRS Scheme. PAN Card has been made a mandatory document for a person to do outward remittance from India. This is because earlier some remitters would approach multiple banks to make remittances abroad. Earlier, it was not necessary to furnish a PAN card for outward remittance up to USD 25,000. This way, they were able to send money abroad more than the LRS limit. However, by making PAN Card a mandatory document, this abuse of the LRS scheme has now been stopped. Now all the remittances abroad of a resident individual can be tracked using their PAN Card. So if you are looking to send money abroad from your bank account, you should be having a PAN Card. Residents may book their tickets in India for their visit to any third country. However, the same (air tickets) would be a part of the traveller’s overall LRS entitlement of USD 250,000. For example, you are going to the US for your studies. You have a flight from Mumbai to London and another flight from London to New York. Then, the air ticket for the domestic/foreign airline from London to New York is counted as part of your LRS limit of USD 2,50,000. RBI does not restrict inward remittances. Any person can remit money from a country abroad to India without any limit. If you are working part-time while studying abroad as a student and wish to send money back to India, then there are no restrictions on inward remittance from RBIs side. The only restriction if any, could be from the country from where you are trying to send money. When you send the money to India, it’ll be tax-free and deposited directly to the beneficiary account (your parents/relatives or friends). If your parents are struggling to pay off the education load or need some financial help, you can send money to India without fear of any extra charge (like tax) levied on the money in India. Remit back to India without any limit. Resident individuals maintaining a foreign currency account with a bank in India or a bank abroad are free to obtain International Credit Cards (ICCs) issued by overseas banks and other reputed agencies. The charges incurred against the card either in India or abroad can be met out of the funds held in the foreign currency account in India of the cardholder or through remittances from India through a bank where the card-holder has a current or savings account. The remittance for this purpose should also be made directly to the card-issuing agency abroad. There is no monetary ceiling fixed by the RBI for remittances, if any, under this facility. The LRS limit shall not apply to the use of ICC for making payment by a person towards meeting expenses while that person is on a visit outside India. However, use of ICCs/IDCs is NOT permitted for prohibited transactions indicated in Schedule 1 of FEM (CAT) Amendment Rules 2015 such as the purchase of lottery tickets, banned magazines etc. Students studying abroad, who have a foreign currency account in a bank which is either in India or in the country they are studying are allowed to obtain an International Credit Card (ICC) from foreign banks and reputed credit card agencies. The payment for the Credit Card Charges can be met out of the said foreign currency account or by way of remittance from India through any current or savings bank account of the cardholder. There is no limit set by the RBI for remittance under this purpose. For expenses abroad using the international credit card, the LRS limit will not apply. However, the use of ICCs is prohibited for transactions specified under FEMA such as the purchase of lottery tickets, betting on race courses and banned magazines etc. A person coming into India from abroad can bring with him foreign exchange without any limit. However, if the aggregate value of the foreign exchange in the form of currency notes, banknotes or traveller’s cheques brought in exceeds USD 10,000 or its equivalent and/or the value of foreign currency alone exceeds USD 5,000 or its equivalent, it should be declared to the Customs Authorities at the Airport in the Currency Declaration Form (CDF), on arrival in India. When a student studying abroad is coming to India (for holidays or permanently), they are allowed to bring with them foreign exchange without any limits whatsoever. However, if the value of the foreign exchange they are bringing exceeds US $10,000 (currency notes and / or traveller’s cheques) or its equivalent, then it has to be declared to the Customs Authorities at the Airport by way of the Currency Declaration Form (CDF). The same is the case if the value of foreign currency notes alone exceeds US $5,000. However, this is not applicable to foreign exchange brought in forex card. On return from a foreign trip, travellers are required to surrender unspent foreign exchange held in the form of currency notes and traveller’s cheques within 180 days of return. However, they are free to retain foreign exchange up to USD 2,000, in the form of foreign currency notes or TCs for future use or credit to their Resident Foreign Currency (Domestic) [RFC (Domestic)] Accounts. The residents can hold foreign coins without any limit. On coming back to India, foreign exchange in the form of currency notes and / or traveller’s cheques up to US $2,000 or its equivalent can be held indefinitely. Foreign exchange above this limit must be surrendered to an authorized dealer (RBI approved money changers or banks). This limit does not apply to forex card. Foreign currency in forex cards can be held indefinitely till the expiry period of the card. While studying abroad it is prudent to remain on the safe side of the law by taking special care to follow the necessary rules. This would ensure that your study abroad experience remains smooth and pleasant. Select a bank or RBI authorized money changer through whom you want to send money abroad. Select the one offering the best exchange rate. The bank account from which you are making the remittance should have been maintained for at least a year prior to the remittance. In the case of a new account, bank statements for the previous year or copies of the latest income tax assessment order or tax returns filed ought to be submitted. Submit A2 Form outlining the motive of your remittance. Transfer the funds to the account of the bank or the money changer so that they can transfer the fund the beneficiary abroad. You can complete all these steps through the forex portal of ExTravelMoney within 4 clicks of your computer mouse! ExTravelMoney’s online platform will help you narrow down the Authorised Dealer providing the best exchange rate in your town or city. You can then select the best exchange rate and book the money transfer transaction online itself. We only have tie-ups with RBI approved forex stores. Note: Bankers may insist customers present form 15CA/CB but this is not required for remittance. “The documents 15CA/CB are not really required for these transactions and RBI identified them as being dispensable. Based on the experience of our customers who have dealt with banks for LRS based remittance, the cost of obtaining these documents can be anywhere between Rs 3,000 – 6,000. This is one of the main reasons that they have instead opted to our online platform instead. We complete the process as soon as possible, within 2 to 24 hours at max. Also, we provide outward remittance through our platform at the best exchange rates. A person sending Rs 20 Lakhs abroad can easily save Rs 25,000 through ExTravelMoney compared to banks in India” says George Zacharia, Co-Founder & CEO of ExTravelMoney.com, an online solution that enables Indians to do foreign exchange and remit money abroad from the comfort of their home. Parents who have sent their wards for studies abroad are the biggest users of the LRS, using this window to pay both the fees and regularly meet the student’s living expenses abroad. We hope this post is helpful to both parents and students in resolving their doubts regarding outward remittance under the Liberalized Remittance Scheme. Also Read : How Much Tax You’ve To Pay On Foreign Exchange Transactions In India? « 12 Breathtaking places in Europe you have never heard of!